The idea that every family business needs a trusted adviser is a popular one. This adviser is often portrayed as an individual who has a close personal relationship with the family and who coordinates the advice that they receive from a range of specialists. However, this model of a single adviser is not always the most effective when trying to build sustainable trust relationships alongside the generational changes that inevitably occur in family businesses. In an era where every adviser is a specialist, it is necessary to explore an alternative to the individual trusted adviser. 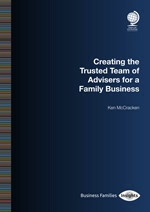 This special report describes how family businesses can benefit from a high-performing, inter-disciplinary advisory team for trusted advice, with members sourced from different organisations, and who have demonstrably effective processes for looking after an entire family and their business interests. Members of such a team are committed to helping the family achieve success in terms of both family and business life and, like a true team, this success is dependent on all team members. High performance advisory teams are used in many areas of commerce, sport, science and the arts and this report demonstrates how the same can be true for advisers who serve family businesses, regardless of their specialism.